In this article I'm going to consider Universal Basic Income (UBI) from a libertarian perspective, focusing mainly on analysis of the labour market, rather than the much more common libertarian "small state" argument in favour of UBI. The current labour market is terribly unfree as it is because it relies on coercion, workfare, sanctions, draconian anti-labour legislation etc. The introduction of Universal Basic Income would would create a much freer labour market (no more threat of destitution, sanctions or forced labour schemes, and much freer labour contracts between employers and employees), but this increased freedom for the majority would come at the expense of necessary measures in order to control inflation (which would rapidly destroy the project if left unchecked). The reduction in aggression against the majority of workers would outweigh the infringements on the current rights that rentiers have to exploit access to basic commodities in order to extract profit for themselves (which it can be argued is another form of aggression against the majority anyway). Many people are under the mistaken impression that the word "libertarian" refers exclusively to an extreme form of US free market fundamentalism associated with Ayn Rand, the Tea Party and the like. However the right-wing fringe in the US appropriated the word for their own use with little regard to the other inherent meanings it had before. The origins of libertarianism can be traced to the 18th and 19th Century anarchist and and socialist movements in Europe, however it was quickly embraced and integrated into laissez-faire capitalist theory too. One of the most famous left-libertarians was the American Henry George (1839-1897), who opposed rentierism, and argued in favour of Land Value Tax. Many Georgists have argued that the proceeds from Land Value Tax should be used to fund a citizens income, or Universal Basic Income. Left-Libertarianism is not as famous as its rabid Ayn Rand inspired American cousin, but it is an increasingly popular political stance, and one which I personally embrace. If you're not fully versed on what Universal Basic Income (UBI) is, I suggest that you read my introductory article before coming back to finish this one. If you haven't got time for that, or you are reasonably clued up about what UBI is, I'll just provide a short summary. UBI is an unconditional payment that is made to every qualifying individual within an economy. There is no means testing at all, other than determination that the individual is eligible (a citizen in the economy for example). Ideally the UBI is set at a rate which is sufficient to ensure that all recipients have access to basic human necessities (a home, sufficient food and water, basic energy needs ...). This concept is generally appealing to libertarians on a basic level because it dispenses with almost all forms of state means testing, meaning a smaller, and less obtrusive state. In this article I'm not going to focus on this compelling "smaller state" argument for UBI, in favour of considering the libertarian case for UBI from a labour market perspective. What makes the current labour market so unfree? Labour is a fundamentally important factor in any economy. Orthodox economic theories tends to treat labour as if it is just some other kind of basic commodity, however, if it is to be referred to as a commodity at all, it must be recognised as a very special and distinct form of commodity, one that can be created at will, and which takes myriad potential forms. The neoclassical orthodoxy fails to treat the labour market as utterly different to other commodities markets and it also fails to recognise the unequal nature of the market in labour, where the employer at a huge advantage over the employee. There are innumerable factors that put the buyer at an advantage of the seller in the labour market, but perhaps the most significant is the creation of false abundance via political policies aimed at retaining a constant pool of unemployment, the "reserve army of unemployment" as Marx defined it in the 19th century, or the "price worth paying" as it was described by former Tory Chancellor Norman Lamont in 1991. In 1918 Bertrand Russell argued against this inequality in the labour market, proposing a kind of basic income so "the dread of unemployment and loss of livelihood will no longer haunt men like a nightmare". The constant threat of destitution is a powerful means by which employers can drive down wages and working conditions, putting them at an unfair price advantage over the worker. If the scale of unemployment has been brought about via deliberate economic policies based on the equilibrium rate of unemployment, this is a clear case of the state trampling all over the libertarian non-aggression principle. If government policies result in your labour being coerced from you at a lower rate than you would be willing to sell it, solely because you fear destitution if you don't work for low wages, you're suffering aggression at the hands of the state. The spectre of unemployment and impoverishment created by economic policies aimed at maintaining "extra capacity" in the labour market is not the only current example of aggressive coercion in the labour market. One of the starkest examples of a labour policy which violate the libertarian non-aggression principle is the kind of mandatory unpaid labour schemes for the unemployed collectively termed "Workfare". These schemes coerce the unemployed, under threat of absolute destitution, into giving up their labour for free, often to highly profitable corporations. It's bad enough that the state uses the threat of destitution (via welfare sanctions) to undermine the aggregate value of labour, but that ministers of the government openly declare that they believe that the state has "a right" to extract the labour of the individual for no wage at all, demonstrates an extremely illiberal attitude towards the labour rights of the individual. These mandatory unpaid "Workfare" labour schemes demonstrate beyond doubt that the ministers involved in administering these schemes believe that the labour of the individual actually belongs to the state. If your government acts as if it believes that your labour is a commodity which belongs to the state, and which can be extracted and distributed for free to favoured corporations, the labour market isn't just unfree, it is grotesquely authoritarian. How would UBI make the labour market freer? 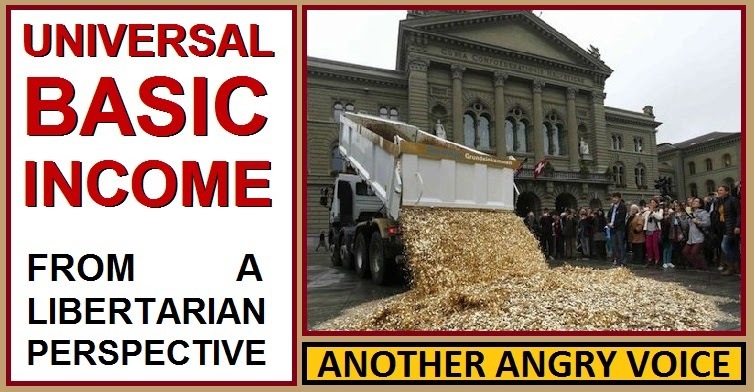 If every individual received an unconditional basic income sufficient to meet their fundamental human needs (housing, food and water, energy, health care ...) the threat of destitution would cease to necessitate people into accepting wages and working conditions they deem unfair. An unconditional basic income would also render totally unworkable the draconian regime of "Workfare" labour extraction schemes enforced via draconian welfare sanctions regimes. If the individual has a right to an unconditional subsistence income, the state loses the power to coerce and intimidate the individual into giving up their labour for free with threats of destitution, starvation and homelessness. Even if we accept the wrong-headed idea that labour is a basic commodity with a defined value (the national minimum wage for example), we have to accept that coerced unpaid labour represents theft, and a clear violation of the libertarian non-aggression principle. Universal Basic Income would render this form of theft by the state totally unworkable, because the state would have no right to revoke the unconditional incomes of those that won't comply with their unpaid labour extraction schemes. I've explained a how UBI could benefit society and the economy in the primer article on the subject, so I'll try to be concise here. The free labour market that UBI would create if administered correctly, would benefit society by alleviating extreme poverty, which would lead to a fall in poverty related social problems such as crime and poverty related ill-health. Another benefit to society would be that the existence of UBI would push up the cost of employing people to do undesirable jobs (disgusting, dangerous or debilitating work), meaning that in turn there would be much greater financial incentives for companies to invest in technology to automate such work. The development of technology to eliminate undesirable jobs would benefit society and the economy (fewer people working in undesirable jobs, greater demand for high-tech solutions). UBI trials have shown that people generally don't stop working and laze about once their basic necessities are provided, in fact UBI works as an economic stimulus, because people have more time to invest in starting their own businesses, and the public has more money to spend on consumption. The only demographics to substantially reduce the hours they work are mothers with young children and young people in education, it is arguable that these reductions are actually beneficial in socio-economic terms. Why is controlling inflation so important? Controlling price inflation would be absolutely crucial to the success of any Universal Basic Income project because without measures to stop the inflation of basic necessities (rent, utilities, food ...) the gains that UBI would provide would soon be eroded away as price rises diminish the value of the basic income payment so that it is no longer sufficient to cover the basic costs of subsistence. If inflation is allowed to run rampant, the benefits of Universal Basic Income would soon be transferred from the ordinary citizen that receives it, to the rentiers that take advantage by hiking the prices they charge for the provision of basic commodities and services. If the rentiers are allowed free rein to profiteer from basic income provision, they will simply inflate their prices in order to soak up the entire value of basic income to cover the cost of some necessity of life (rent, transport, childcare, energy consumption). If the parasitic behaviour of rentiers is not controlled, all of the socio-economic benefits would soon be siphoned off as into the bank accounts of the most ruthlessly self-interested rent seekers. Essentially Universal Basic Income would turn into a government subsidisation scheme for the most ruthlessly self-interested, which is precisely the kind of system we have now, which is one of the main reasons people have been proposing the introduction of UBI in the first place. The only practical way to stop this kind of rent seeking behaviour from destroying UBI would be to introduce some form of market regulation to prevent landlords, utilities companies, childcare providers and the like from massively inflating their prices in order to soak up the economic benefit of UBI for themselves. Anyone that believes that there is such a thing as a perfectly free market is living in the same cloud-cuckoo land as those that believe a totally state controlled economy is a possibility. What is up for debate is how more market freedom can be created. The orthodox neoliberal would argue that greater market freedom is produced through deregulation, but the huge growth in inequality, the ever increasing size of economic crises and the rise of vast "too big to fail" oligopolies since the neoliberal craze of privatisation and deregulation became the economic orthodoxy in 1980s, suggests that they are wrong. Deregulation and privatisation have increased the freedoms of corporations and the super-rich at the expense of the majority, who have seen their share of national incomes eroded away dramatically since the late 1970s despite rising productivity. Others might argue that the best way to stimulate market freedom is through the creation of a "fair market", through carefully planned market regulation. Rules to prevent (and properly punish) anti-competitive practices such as price rigging, formation of oligopolies, monopolies and cartels, financial doping, insider trading, political patronage, front running, information asymmetry, dividing territories, corruption and outright fraud, would create a freer and safer market for individuals and small businesses, which would increase competition and efficiency, but at the cost of the freedoms of those that currently profit from the use of anti-competitive practices. The same kind of debate can be had over the introduction of rules (rent caps, inflation controls on basic commodities and services ... ) to prevent the rentier class form extracting the benefit of Universal Basic Income for themselves. The infringement of their "right" to gouge as much profit as possible out of basic commodities and services, would have to be weighed against the greater economic freedoms afforded to the majority. Essentially it boils down to the question of which is the most important; freeing up the currently unfree labour market or the continuation of free market in the provision of fundamental commodities and services? 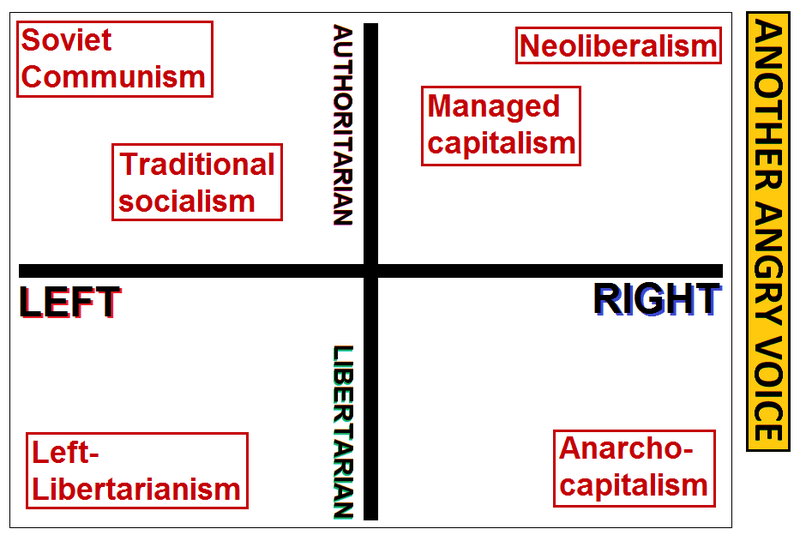 Providing more freedom in which of these markets would create the biggest increase in aggregate freedom, and which would be most compliant with the libertarian non-aggression principle? In my view the answer is obvious. The freedom of the majority outweighs the freedom of the minority. Before I conclude I'd like to state that this labour market analysis is far from the only libertarian argument for the introduction of Universal Basic Income. Other arguments include the most common "small state" argument because universal welfare would reduce the size of the state by reducing the number of functions of the state. Another argument can be made that since there would be no means testing, UBI would provide greater freedom from intrusion by the state into the private lives of the individual. Perhaps the most compelling libertarian argument in favour of Universal Basic Income is that perhaps freedom from destitution in itself is the most important liberty, because without freedom from destitution the individual is often left facing either the suffering of destitution, or the suffering of wage slavery. Labour is a fundamental element of any economy (be it capitalist, state socialist or anywhere in between). and an unfree market in labour is fundamentally incompatible with libertarianism. If the deliberate economic policies of the political establishment in your country mean that your labour can be coerced from you at a lower rate than you would be willing to sell, simply because of the threat of absolute destitution, this is clearly an act of aggression on the part of the establishment. If your government acts as if it believes that your labour is a commodity which actually belongs to the state, and can be extracted from you for no recompense at all, this is an even more vile example of state aggression. The introduction of Universal Basic Income would put an end to both of these forms of labour market aggression, but in order for it to work measures to prevent rentiers from profiteering by inflating the prices they charge for basic human necessities would need to be introduced. Thus the debate is not over whether UBI is compatible with libertarianism (it clearly is) but whether the benefits from the greater freedoms in the labour market would outweigh the necessary losses in freedom of rentiers to profiteer from the provision of basic human needs, which would be necessary in order to prevent the whole project collapsing into inflationary chaos. In my view the freedoms of the majority should outweigh the freedoms of the minority, and in any case, the current freedom to profiteer from the provision of basic human necessities that the rentier class enjoy can actually be viewed as a form of aggression in its own right. Why should the profits of the minority take precedence over the basic human needs of the majority? Why do right-wing people support "Workfare"? Too big to fail"? - Nope, "Too big to jail"
Sometimes it is easy for me to take my understanding of basic economics for granted. 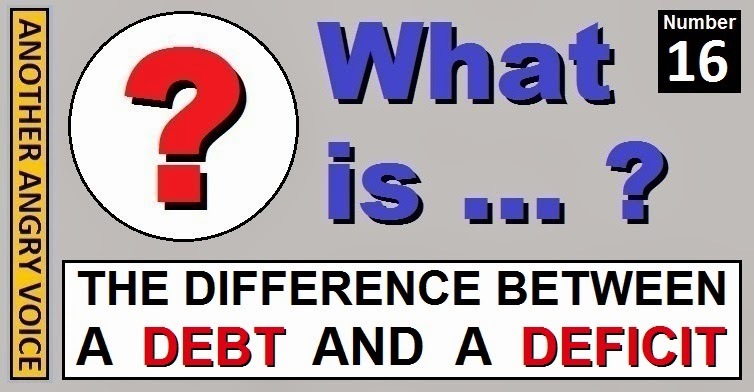 Having written articles explaining things like Credit Default Swaps, Information Asymmetry and Fiscal Multipliers in this series, it is a bit of a step down to explain the difference between simple economic concepts like debt and deficit, but I have two good reasons for doing so. Firstly, the education system in the UK has denied the vast majority of state schooled children an education in the economic fundamentals. The 7% of kids that attend private fee paying schools are much more likely to receive a basic education in economics at a young age, then to attend Oxford University universities in order to study Politics, Philosophy and Economics (which has represented an open door to political power to countless politicians ranging from honourable politicians like Tony Benn, all the way down to untrustworthy spivs like David Cameron). Without the basic grounding in economics that the children of the wealthy tend to receive, many ordinary people go though life, by no fault of their own, as functional economic illiterates. The second reason is that even people in positions of power that should know this absolutely foundational economic stuff get deficits and debts confused. One of the prime examples being the Tory MP Claire Perry, who proclaimed debts and deficits to be "the same thing" during a Radio 4 interview in 2012. The ordinary man or woman in the street has an excuse for this kind of confusion (having never received an education in the economic fundamentals). Claire Perry MP has no such excuse having worked for two banks (Bank of America, Credit Suisse) a major management consultancy firm (McKinsey), an advisor to George Osborne (2006-2009) and an economic spokesperson for the Coalition government. It is no wonder that the economic system failed so spectacularly in 2008-09, and that George Osborne's economic plans have been so ruinous if a person can have a career like that without apparently knowing the fundamentally basics of economics. I find that the best way to explain the difference between a debt and a deficit is through the use of a simple driving analogy. Lets imagine that the speed of the car is the debt and the rate of acceleration is the deficit (the rate at which the debt grows). If you put your foot hard to the floor (run a high deficit) the speed of the car (the size of the overall debt) increases rapidly. If you apply the accelerator gently (run a small deficit) the speed of the car (size of overall debt) still increases, but at a slower pace. Once you are aware of this, the true meaning of the Tory bluster about how they've "cut the deficit by a third" becomes clear. It is an open admission that they are still borrowing ever more money, and they've not even halved the rate of borrowing that was going on during the incredible fallout from the biggest financial sector insolvency crisis in human history (2009-10). They just seem to be hoping that people are too economically uneducated to read between the lines of their bluster about the cuts they've made. Returning to the car analogy, the Coalition government still have their foot on the accelerator quite hard, but they're trying to convince their passengers (the public) that the car is getting slower with misleading narratives about how they are "paying down Britain's debts" to quote David Cameron verbatim. Anyone who claims (as Claire Perry did) that a debt and a deficit are "the same thing" is essentially saying that the speed of our hypothetical car and its rate of acceleration are "the same thing". For someone actually working in the field of economics to make such a ludicrous claim is akin to a physicist (lets say a NASA engineer) not knowing the difference between the speed and acceleration of the space flight he's supposed to be plotting the trajectory for. 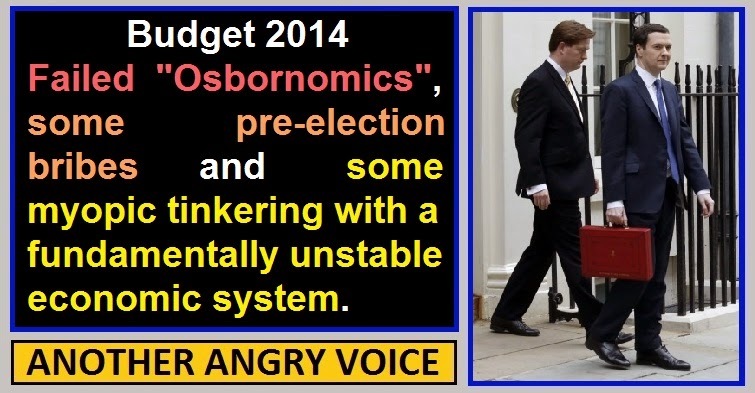 When George Osborne came to power in 2010 he made two claims repetitively. That he would eliminate the budget deficit via his ideological austerity experiment, and that he would protect the AAA credit rating of the UK economy. He has failed dismally to achieve either of those objectives. According to his latest (still fantastical) projections, the deficit won't be eliminated until 2018-19 (well into the next parliament) and under George Osborne's watch the UK has been stripped of its AAA credit rating for the first time since the 1970s.The fact is that George Osborne has already borrowed more money in under four years than New Labour did in the preceding 13. Another fact is that by 2015 Osborne will have racked up a mind boggling £207 billion more in debt than he projected he was going to back in 2010. It is absolutely no surprise at all that "Osbornomics" has failed so demonstrably, given that he himself has no formal economics qualifications, and his economics adviser between 2006-09 is apparently so economically illiterate that she thinks a debt and a deficit are the "same thing". To illustrate exactly how clueless the Tory shadow treasury were at the time Claire Perry was Osborne's economics adviser, it is worth noting that George Osborne was still describing the Irish economy as "a shining example of the art of the possible in policy-making" and explaining how the UK should emulate them in 2006. 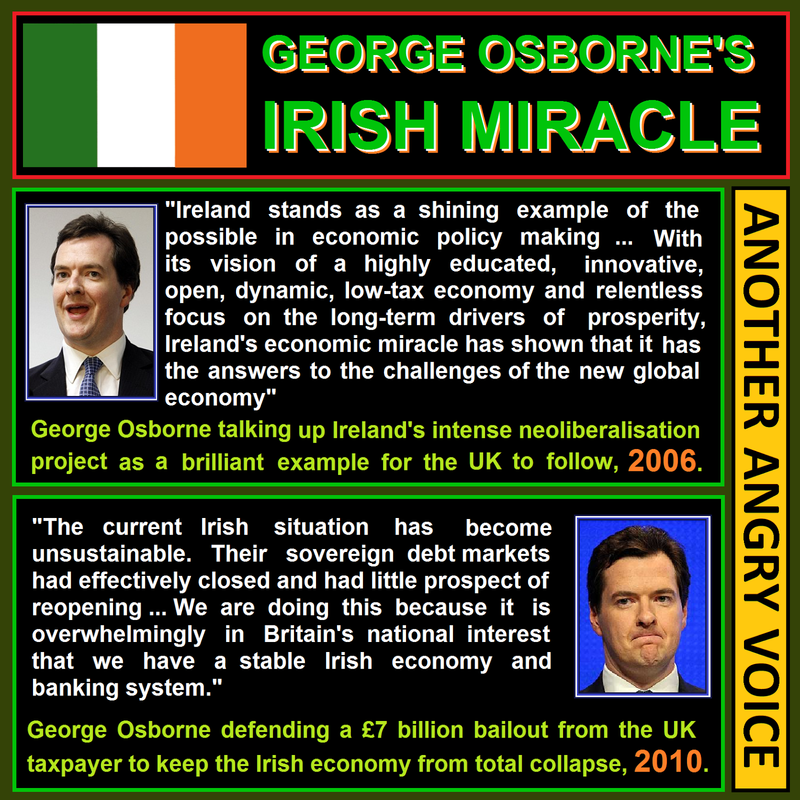 Osborne's Irish eulogy came just 2 years before the Irish economy imploded catastrophically, and just 4 years before Osborne himself had to sign off on a £7 billion bailout for Ireland because their "shining example of the possible" had revealed itself to be a classic illustration of a crony capitalist Ponzi scheme scaled up to the national level. I hope that after this explanation you have a better understanding of the basic difference between a debt and a deficit (and a handy little analogy to remember it by). I hope you also appreciate how utterly scandalous it is that a Tory party economics adviser could be so clueless as to confuse these two very basic economic concepts, and even claim that they are "the same thing". Explaining the failure of "Osbornomics"
What is ... Capital Flight? What is a ... Credit Default Swap? 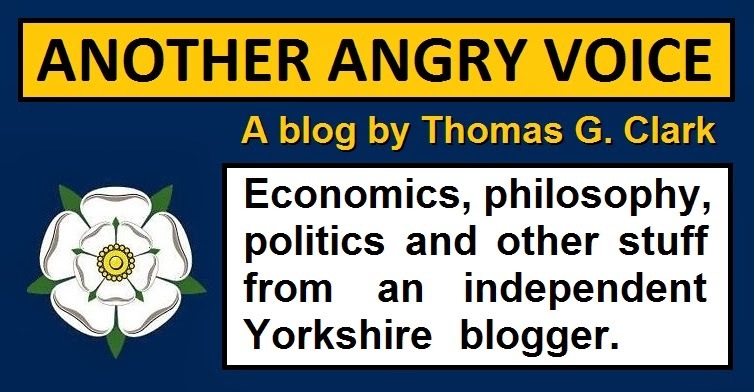 In the environment of UK politics, the cry of the common UKIP supporter is a familiar one. When confronted with the irrefutable facts that UKIP is an extreme-right party, stuffed full of people too right-wing even for the Tory party, and bankrolled by former Tory party donors, the response of the common UKIP supporter is to squawk "but I'm not right-wing" and "I only support UKIP to get us out of Europe". Why do so many left-wing people vote for UKIP? It seems hard to believe that so many people with left-wing or centre ground political beliefs would openly support a party on the extreme-right fringe, but the evidence shows that this is actually the case. In November 2013 a YouGov poll on renationalisation clearly demonstrated that the majority of UKIP supporters favour very explicitly socialist ideas. 78% of UKIP supporters responded that they supported outright renationalisation of the UK energy market, and 73% of them supported renationalisation of the rail network. The idea that UKIP (a political structure composed of, headed by, and bankrolled by the extreme-right fringe of the Tory party) would ever renationalise anything is absolutely laughable, so it seems that the large majority of UKIP supporters are so desperate to get out of Europe that they will vote for a party that adheres to an opposite economic ideology to their own (the neoliberal orthodoxy). The "I only support UKIP to get us out of Europe" is a particularly ludicrous stance because people that want to make clear their desire for a referendum on Europe have another option, which is to vote for the Green Party instead of voting for the Tory party on steroids. 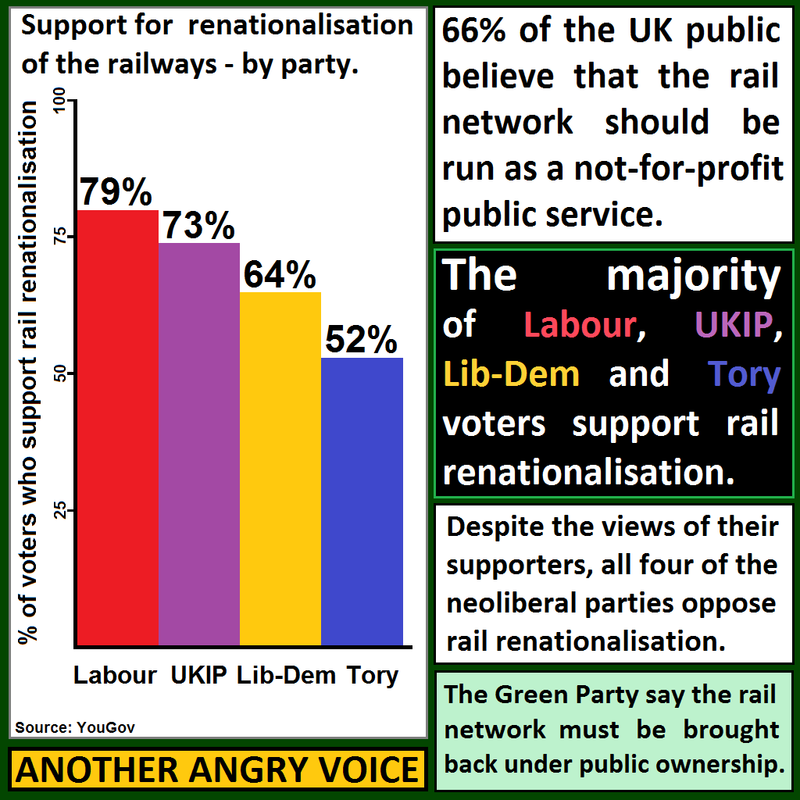 Not only have the Green Party made commitment to holding a referendum on Europe, they also have manifesto commitments to the kind of left-wing/social democratic politics (such as rail renationalisation) that the majority of UKIP supporters actually favour. Meanwhile UKIP don't even have an official manifesto after Nigel Farage publicly disowned the contents of the 2010 UKIP manifesto, deriding it as "drivel". Why would anyone that supports the left-wing idea of renationalisation vote for an extreme-right party on the grounds that they want out of Europe, when there is a left-wing party that offers a referendum on membership of the EU, without all the bonkers right-wing extremism, and a commitment to renationalise the railways into the bargain? I realise that most people won't be aware of the Green party policy on Europe, because of the appalling paucity of mainstream media coverage on the Green's policy based approach to politics, in favour of covering the circus freak show that is UKIP*, so I'll outline the Green Party stance on the EU. Firstly I'll give a basic interpretation of their stance, then I'll provide numerous quotes from the Green Party to substantiate what I've said. The Green Party favours a referendum on the EU because they are opposed to the extremely undemocratic way the EU is currently structured, as well as the unsustainable neoclassical economic ideology that the EU actively promotes. The Green party would prefer to see the EU reformed from within to make it more democratic and more accountable. They would also like to ditch the ideological obsession with the neoclassical economic orthodoxy and the ridiculous single currency experiment. The Green party is committed to a referendum of the EU, but they have not decided which side of the debate they would side with. They want the referendum because they believe that the debate would trigger reform of the EU, however if major reforms are not forthcoming, it seems highly likely that the Greens would campaign for an EU exit, since the structures and objectives of the EU as currently constituted are fundamentally incompatible with the core Green values of democracy and sustainability. "I support a referendum on our membership of the EU because I am pro-democracy." Here are some quotes from the Green party policy document on the EU which confirm that they have correctly identified the major problems with the way the EU is structured. "The Green Party is opposed to the objectives, structure and policies of the EU as currently constituted." " The Green Party believes that the excessive influence of the Commission and its associated bodies compared to the Council and Parliament is both undemocratic and unaccountable." "[The Eurozone] is run by the European Central Bank (ECB), a collection of bankers appointed by Council subject to no effective democratic control, but able to override the democratic decisions made by member countries." "A major weakness of the present European Union is the lack of mechanisms to ensure that the powers and structures of the EU have the consent of the citizens of member countries." "The Green Party is opposed to EMU and the single currency. We believe it undermines local and regional economies." "The Green Party is opposed to the UK joining the Eurozone. We are committed to a referendum on any such decision and will join the campaign for a 'No' vote in any such referendum." "Whilst the Green Party is opposed to the objectives, structure and policies of the EU as currently constituted, as long as the U.K. remains a member of the EU the Green Party will stand in elections to the European Parliament and elected Green MEPs will work for fundamental reform of the EU from within." The next set of European elections occur in May 2014. These elections are an excellent opportunity for people to express dissent with the political system because they are conducted on a proportional basis, meaning there are no such things as "safe seats" nor "wasted votes", as with the archaic and unrepresentative Westminster voting system used in General Elections. Recent opinion polls show that the fight to become biggest UK party in the European Parliament will in all probability be between Labour and UKIP. Meanwhile there is a very interesting battle for fourth place between the Liberal Democrats (currently projected 8%) and the Green Party (currently projected 6%). In my view the election in May is an ideal opportunity for left-wing people to express their discontent with the political system by making sure that the Green Party leapfrog the Liberal Democrats into fourth place. This isn't particularly unrealistic given the appallingly low turnouts at European elections (just 34% at the last election). If just a few hundred thousand people vote Green instead of voting UKIP, voting Labour or simply staying at home, the Lib Dems could easily be relegated to 5th place. Unlike UKIP, the Green Party is an actual alternative to the neoliberal orthodoxy of privatisation, deregulation, tax cuts for the rich & austerity for the poor. 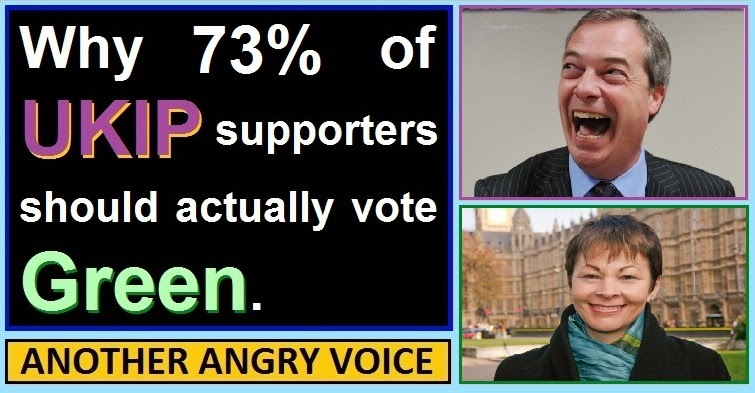 Voting Green would would show support for an EU referendum, without endorsing the kind of right-wing economic fanaticism that is absolutely rife within UKIP. If just few hundred thousand more people vote for the Green Party in May, we could all enjoy seeing the Lib-Dems relegated to 5th placed also-rans. If on the other hand, those extra few hundred thousand vote for UKIP, we'll just get one or two more UKIP MEPs, who may well end up either defecting to the Tories (Marta Andreasen) or getting thrown out of the party for spewing sexist bile (Godfrey Bloom). * This bias is understandable given that stuff like UKIP councilors spouting anti-gay diatribes and Nigel Farage swilling pints is online "clickbait", whilst serious political analysis seems to be considered increasingly oldfashioned and unpopular. George Osborne's 2014 budget was laughably self-congratulatory and ludicrously over-optimistic stuff (UK budgets are rarely anything but), however, essentially it was just more tinkering with a fundamentally broken system. The actual 2014 Budget Document runs to 120 pages, so there's no way to analyse it all in one blog post. It is fair to say that not all of the policies are bad in themselves, but as a package it is a sad demonstration of economic myopia. Aside from the headline grabbing launch of the new £1 coin (which will set the economy back tens of millions to retrofit millions of shopping trolleys, vending machines, ticket machines etc), the cut in Bingo tax and another ludicrous 1p reduction in beer duty, there are a number of more important factors to consider. I'll start by comparing some headline figures. The press ran with the headline figures presented in the budget (such as the one boasting a marginally increased growth rates from the last set of economic predictions), but relying on the government's own cherry-picked economic indicators is feeble churnalism of the worst kind, and in my view, an overt demonstration of complicity with the agenda of the government. If you want that kind of shallow and misleading analysis I suggest you turn to the mainstream media oligopoly for more comforting regurgitated statistics presented in an uncritical manner. I'm going to compare the headline figures from the 2014 budget with the predictions George Osborne and the OBR paraded around in November 2010. The reason I'm comparing the current figures with some of their initial economic predictions, is that this will give a much clearer idea of what kind of job they have actually been doing for the last four years. The 2014 Budget predicts that the nominal GDP of the entire British economy will be £1,788 billion in 2015/16, when the next General Election is held. In November 2010 they predicted that it would be £1,916 billion. That's a calculation error of £128 billion! The 2014 Budget predicts that the debt to GDP ratio* will be 78.7% by 2015/16. 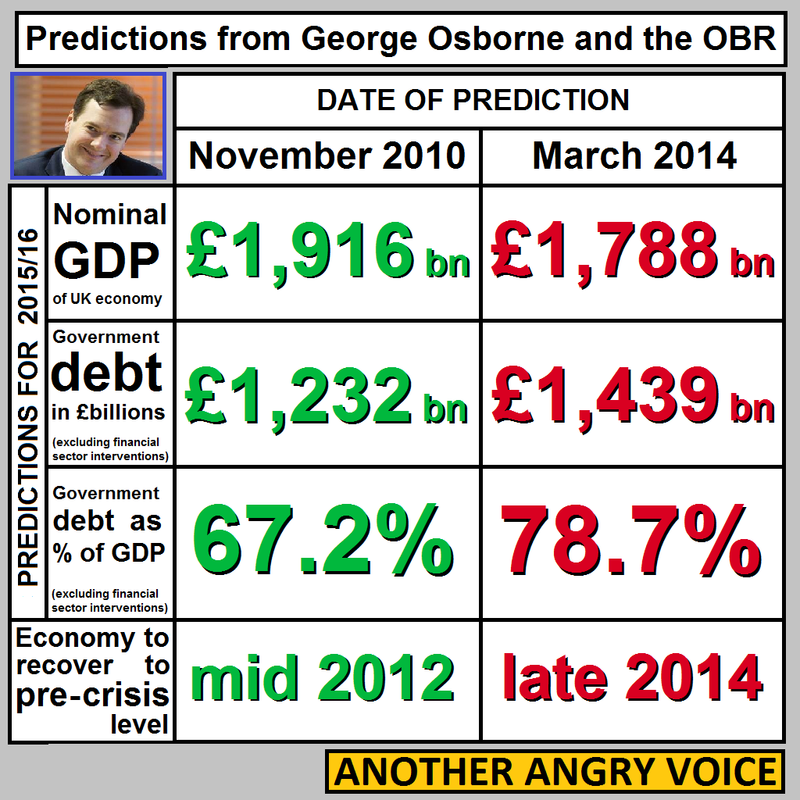 In November 2010 Osborne and the OBR predicted that it would be 67.2%. This means that George Osborne will have borrowed so much more than he claimed he would, that the difference will be worth 11.5% of the entire UK economy in 2015/16! The 2014 Budget predicts that the national debt* will total £1,439 billion. In November 2010 they predicted that by the same stage it would only be £1,232 billion. That's a mind-boggling £207 billion miscalculation. The borrowing projections that George Osborne and the OBR presented in 2010 were out by an absolutely astonishing 16.8%. George Osborne ceaselessly bangs on about how the Tories have reduced the deficit by a third, as if that represents some kind of success. What he fails to mention is that in 2010 he was bragging that he would completely eradicate the budget deficit by the end of this parliament in 2015/16. The economic figures presented in this budget admit that the deficit will not be eradicated until 2018/19, and that's in their best case scenario in which there is no kind of economic crises in the next 4 years. Instead of giving us the 0.3% surplus he promised us in 2010, Osborne will instead be leaving a 4.2% budget deficit behind him. That's a miscalculation worth 4.5% of the entire economic output of the UK for the 2015/16 period!One of the things that illustrates how much of a catastrophe "Osbornomics" has been in its own terms is the admission that the UK economy will only recover to its pre-crisis level in the third quarter of 2014. Their November 2010 predictions projected that this recovery would have already happened in mid 2012! This is an astonishing miscalculation because it has taken significantly more than twice as long as Osborne and the OBR said it would for the UK to return to pre-crisis level. These headline figures illustrate the sheer scale of George Osborne's incompetence, yet the man is so delusional that he actually seems to believe his own feeble propaganda narratives, and even sees himself as a candidate to become the next leader of the Tory party! If borrowing £207 billion more than you claimed you would, in order to make the economy £128 billion smaller than you said it would be is some kind of success that qualifies you for a promotion in George Osborne's mind, one must wonder what on earth a failure must look like? These demographic groups have suffered badly under George Osborne's catastrophic economic mismanagement, but now he's hoping that they are all so stupid that if he slings a few coins at them as pre-election bribes, they'll all flock to the polling stations in order to vote Tory. Ordinary workers have suffered terrible wage deflation since 2010, meaning that the vast majority of people are worse off in real terms than they were in 2010. This deliberate campaign of Tory wage repression has stalled economic demand, forced hundreds of thousands of families into reliance upon social security they didn't previously claim (Tax Credits, Housing Benefits ...) and caused even greater levels of private debt accumulation. Now Osborne seems to think that an ever-so-slightly above inflation increase in the National Minimum Wage, to £6.50, will be enough to trick "the lower orders" into feeling that they are better off, even though they will still be dramatically worse off than they were in 2010, before the Lib-Dems enabled the Tories into power. Another part of the budget illustrates the classic Tory trick of giving with one hand, and taking away even more with the other. Extending the spending cap on social security until 2018-19 means that in-work benefits (such as Working Tax Credits, Child Tax Credits, Housing Benefit, Income Support, Statutory Sick Pay, Maternity & Paternity Pay and Child Benefit) will all continue to be cut in real terms for the next four years. Yes, the increase in the minimum wage will give the very lowest income workers an extra few pennies an hour, but the value of that will be more than eroded away by the fact that their in-work social security payments will continue to decline rapidly in value for the next four years. In 2012 the Bank of England admitted that their policy of quantitative easing has cost pension funds £270 billion. After another 18 months of all-time record low interest rates of 0.5%, the scale of the damage is likely to be a whole lot worse. George Osborne is hoping that by allowing people to take out lump sums from their vastly reduced pension pots (in order to allow them to buy themselves Lamboghinis according to Lib Dem welfare minister Steve Webb), they'll be so overjoyed that they'll forget how much value their pension has lost since 2010. The reduction in the rate of tax charged on bingo winnings is another blatant effort to woo the grey vote, despite the fact that these people have been totally ripped off for the last four years in order to protect the interests of the reckless speculators that actually trashed the UK economy in the first place. Again, Osborne's pension reforms are an example of chucking a few coins at the plebs and hoping that in the excitement, they'll completely forget how much they have been ripped off over the last four years. You don't have to be any kind of economics genius to realise how badly savers have fared after 5 years of all time record low interest rates of just 0.5%. The budget measures to triple the amount savers can avoid in tax in ISA schemes to £15,000 per year are yet another demonstration of the pre-election bribe that is worth so much less than the scale of the losses over the last four years. One thing that was conspicuously absent from coverage of the 2014 Budget was an announcement on VAT. Surely nobody can have forgotten than in April 2010 (one month before the General Election) George Osborne Said that "our plans don't involve an increase in VAT. We say that it's wasteful spending that's cut, not putting up taxes", then in his June 2010 emergency budget (just one month after the General Election) he performed an about face (so rapid that it probably even surprised his Lib-Dem coalition partners) to hike VAT to 20%. The fact that no reduction in VAT has been put forward in this budget shows that despite giving his word that he would not hike VAT, consumers will have been paying the higher rate of VAT for virtually the entire duration of the coalition government. Tucked away in the 2014 Budget report is the announcement that £5 billion worth of public property is to be sold off. Not much detail is provided on how this land privatisation will be conducted, but it is pretty safe to assume that a similar process to the Royal Mail privatisation will be used, where the government gets several banks to estimate the value of the public assets, then picks the lowest estimate so they can sell it off at a fraction of its true value. The Budget report also brags about how 3,846 Academy schools have been created since 2010. What millions of people fail to realise is that this has been a backdoor privatisation process of the English education system. The property deeds for those schools have been given away, for free, to unaccountable private sector pseudo-charities, many of which pay ludicrously high executive salaries to a handful of insiders, whilst the people that actually do the work of running the schools and teaching the kids suffer George Osborne's below inflation wage repression policies. In the same week that the Bank of England admitted that the banking sector in the UK is a private money creation cartel, the 2014 Budget shows how no fundamental reform of the financial sector has been undertaken. The policies of the political establishment in Westminster and the Bank of England are aimed at protecting establishment interests (bailouts, corporation tax cuts, top rate tax cuts, new tax-dodging loopholes, quantitative easing) at the expense of the majority (through austerity, wage repression, social security cuts, mass privatisations, cuts in labour rights, attacks on the justice system). This kind of economic strategy is simply a continuation of what was going on before the global financial sector crisis and looks set to create an even bigger financial sector meltdown sometime in the future. Policies like the further extension of George Osborne's idiotic "Help to Buy" property price inflation scam look like they have actually been specifically designed to fuel another, even larger, debt backed speculative property boom. The comments on the taxpayer owned RBS in the 2014 Budget are an absolute joke. Just weeks after RBS announced that they had lost another £8.2 billion in 2013, meaning that they've now lost every penny of the £46 billion they received in bailouts in 2009, the Budget 2014 document concludes that RBS is "getting to grips with the problems of the past". Despite these appalling losses, RBS bankers (who work for a company that is 82% owned by the taxpayer remember) carved up £576 million between them in bonuses for 2013. This kind of ludicrous reward for failure is yet another indicator that nothing has really changed in the financial sector. For all of the waffle the 2014 budget contains about the reforms they have made to the financial system, most of the flaws that led to the 2007-08 global financial sector meltdown remain built into the system. The private banks still operate a debt backed money creation cartel, the housing market is still massively over-inflated and personal debt is higher than ever. What is even worse is that after the bailouts and the absolute lack of prosecutions (even over extraordinary crimes like laundering money for Mexican drug cartels and terrorist organisations, Libor rigging, and PPI fraud, let alone the reckless mismanagement that created the financial sector meltdown), Moral Hazard has been well and truly established. The banks are that they are "too big to fail", so they're certain that next time they gamble themselves into oblivion, the taxpayer will bail them out again, and they'll be able to not only avoid jail, but actually keep all of their ill-gotten gains too. Oe of the strongest indicators that nothing at all has been learned from the financial sector meltdown is the extension of George Osborne's ludicrous Help-to-Buy property price inflation scheme until 2020. There is one glimmer of good news, even though Help to Buy is economically illiterate lunacy, some minor changes to the scheme mean that government backed 95% finance will soon be available to fund self-build properties, which would allow small construction firms and self-builders to obtain some small benefit from this economic illiteracy, rather than the virtually all of the benefit going to massive house building companies and property speculators as it does now. Tucked away in the financial analysis are projections that the government intends to raise another £30 billion through Right-to-Buy. Thus the erosion of social housing stock is to continue, even though waiting lists for social housing have never been longer. What the United Kingdom desperately needs is measures to build more social and affordable housing, to control rents and properly regulate the buy-to-let sector, yet George Osborne is determined to pour more fuel on the property speculation fire, and to leave the idle rentier class (and the private banks that fund their property speculation schemes) to extract vast amounts of wealth out of the productive economy with their rent-seeking behaviour. The announcement of an "extra" £140 million to fund flood defence schemes is nothing but an admission that the ideologically driven cuts to flood defence spending enacted early in the parliament were economically illiterate lunacy. Many people have (including myself) pointed out that these cuts were transparent false economies because every £1 spent on flood defences results in £8 in avoided economic damage. I have explained how fiscal multiplication is of fundamental importance to the development of rational economic policy, but George Osborne and the Tories behave as if they are as ignorant of this as they are of so many other fundamentally basic components of economic theory. Giving back some of the money they cut in 2010-11, after all of the flooding in 2012 and early 2014 is nothing but an insult to all those that were flooded out of their homes and businesses. Exactly the same thing can be said about potholes. The roads in the UK are in an appalling state, and when the UK was crying out for a bit of infrastructure investment, to help the fledgling recovery of 2009-10 - instead of putting in £200 million to fix potholes then, Osborne actually set about slashing infrastructure investment on the idiotic assumption that all government spending is essentially 50% waste. Anyone that has had to replace wheels, tyres or suspension parts due to the appalling state of the roads in the last four years is unlikely to thank George Osborne for putting aside a few quid to fix the problem long after they have already shelled out to get their cars fixed. Before I conclude I'd like to focus a little attention on some truly ludicrous economic predictions, found in the section entitled "The Challenge of Debt Reduction" (pages 96-98 in the Budget report). If we think back to the headline figures section of this article, it is absolutely clear that George Osborne and the OBR have a hugely embarrassing track record of making wildly inaccurate economic predictions. If we look at their inaccurate forecasts through the prism of of fiscal multiplication, it becomes clear that a large part of this inaccuracy stems from their use of completely arbitrary assumptions in their economic models. With a track record like this, one would have thought they would in future try hard to avoid such lazy projections based on arbitrary assumptions, but the section I refer to contains precisely the same kind of politically partisan economic gobbledygook that they should be trying to avoid. The part that really grates is where they use inductive reasoning to conclude that there is an economic crisis every 8 years or so, but in their economic prediction until 2035-36, they offer only two scenarios; Either no crisis at all, or a small crisis that costs something like 10% of GDP (ie. less than the 11.5% level of inaccuracy in their own economic predictions from 2010!). If inductive reasoning provides us the dubious conclusion that is a crisis every 8 years or so, there should be at least three between the last crisis, which peaked in 2008 and 2035-36. One around 2016, one around 2024 and one around 2032. The way that the OBR tries to get away with having just one small "illustrative crisis" is by arbitrarily picking 2019/20 (see figure B5) as the start period for their crisis cycle (rather than the last crisis in 2008). This means they can predict one small crisis somewhere around 2027/28 which is a very much more positive illustration than calibrating their one shock every 8 years illustration to the last crisis (meaning three crises between now and 2035/36), or perhaps also factoring in the consequences of another catastrophic meltdown like the last one for "illustrative purposes". In fact the Budget Report says that the last financial sector meltdown was "a major shock, and one that would not be expected to occur very frequently". However, given that George Osborne is intent on reinflating the property price speculation bubble and the banks are still operating their private debt backed money creation cartels in an atmosphere of ludicrous bonuses and immunity from prosecution, at a time of rocketing income inequality and all-time high levels of private debt, does it not seem a little over-optimistic say that another major crisis is "not expected"? The report admits that these projections are only "illustrative", but using two absurdly over-optimistic projections (no crisis at all in the next 21 years, or one small crisis that is smaller than their own economic miscalculations in 2010) they are clearly presenting two misleadingly optimistic scenarios. To put this into perspective, the only period of such stability in the last 150 years is the late 1940s to early 1970s mixed economy period, which is often referred to as "the golden age of capitalism". At that time the UK economy was based on state control of vital services and industries, large-scale housebuilding, wealth redistribution, social mobility and increasing wages - ie precisely the opposite of the policies George Osborne has been pursuing (privatisation, lowest housebuilding levels since the 1920s, severe social security cuts, deliberate social stratification and wage repression). These utterly ludicrous "illustrative" shock predictions tell us absolutely nothing about the future stability of the UK economy, but what they do illustrate very clearly indeed is the political partisanship of the OBR, who have decided to present two absurdly over-optimistic projections for "illustrative purposes", rather than presenting anything resembling a likely set of illustrative predictions (several crises, another financial sector meltdown, a Japanese style "lost decade" ...) that are actually calibrated to reality (rather than some completely arbitrary point in the future). To offer two such wildly over-optimistic "illustrative" predictions is bad enough, but their expectation of no major financial collapse is much worse, especially as this assertion was made in the same week that a NASA backed research document predicted severe global economic instability without fundamental reform to the neoclassical economic orthodoxy**, and just a few weeks after the IMF admitted that the income inequality that their own polices have ruthlessly enforced is a strong impediment to economic development and stability***. The only possible conclusion from the headline figures is that Osbornomics has failed in its own terms. The fact that by 2015, Osborne will have borrowed £207 billion more than he claimed he would, yet the economy will be £128 billion smaller too is absolutely damning stuff, but you won't hear anything about this from the mainstream media. * The national debt figures are calculated using the extraordinarily misleading PSNB ex calculation, which deliberately hides the vast costs of the financial sector bailouts off balance sheet, because if they were included, the national debt would have been around 150% of GDP ever since the financial sector was rescued from insolvency with the largest state subsidies in economic history. ** The report actually used phrases like "precipitous collapse - often lasting centuries" to describe the scale of the threat, and stated that "while some members of society might raise the alarm that the system is moving towards an impending collapse and therefore advocate structural changes to society in order to avoid it, Elites and their supporters, [will oppose] making these changes"
*** Quotes from the IMF research paper: "we find that, contrary to the big trade-off hypothesis, the overall effect of redistribution is pro-growth, with the possible exception of extremely large redistributions" and "It would be a mistake to focus on growth and let inequality take care of itself, not only because inequality may be ethically undesirable but also because the resulting growth may be low and unsustainable". Aaaargh - I just agreed with the Daily Mail! Iain Duncan Smith's "profound moral mission"